The last two months have been such a wild ride. We moved back to Austin from Brooklyn. We started planning really grown-up things like mortgages, Roth IRA’s, children and securing steady income for extended periods of time. We moved from a 600-sq-ft Bed Stuy apartment into my future-mother-in-law’s spare bedroom. There are a lot of things up in the air right now. We both got jobs (me as of today! ); although, we’ve dropped the idea of buying a house until we’re in better shape on paper. This is a disappointment, but more of a relief. I know precisely how to rent a house and make it nice. This post has lived inside my head for two weeks. It was supposed to be about the infallibility of muffins. How muffins are one of the only kitchen projects for me where wild improvisation rarely ends in failure. Well, despite my internally-scripted, marvel-of-Stonehenge kind of feelings surrounding muffins, I ended up with cake. Of this, I am absolutely certain: When life brings you cake, you should eat it. 1. Simple. Lemon cake makes a superb vehicle for the contents of jars that are lingering in your fridge, like my ultra-coveted concord grape jelly. 2. Dee-luxe. Tea and cakes! Make some whipped cream or cream cheese frosting. Add a dollop of Meyer lemon marmalade if you happen to have some on hand. 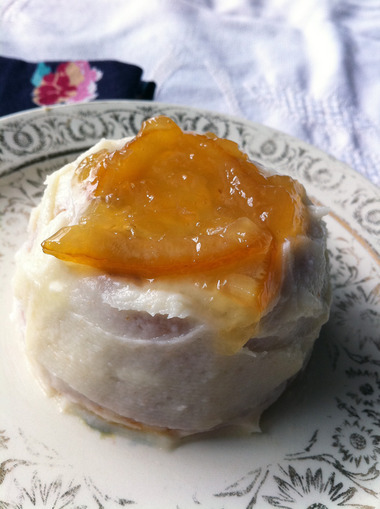 I love Shae’s prize-winning, easy-to-follow Meyer lemon marmalade recipe in her e-book, in fact, today marks the start of her special, Meyer-season discount. Use the code MEYERLOVE during checkout to get $2 off her e-book. That means you’ll buy a book full of delicious recipes that will last you your whole kitchen-life for less than you’d spend on a single jar of artisan preserves at the farmers market: $7.95. Offer ends March 7, so hurry it up and get over to her site. If a purchase isn’t an option for you right now, she has another crowd-pleaser Meyer marm recipe up on her blog that allows you to be as fancy or simple as you please. Pre-heat oven to 400 degrees F. Grease muffin tins really well. 4. Add wet ingredients to your dry ingredients and mix with a spatula until there are no more patches of dry flour. Add your prepared, minced rinds (or zest). 5. Scoop batter into prepared tins. Leave about a half inch space between the batter and the top of the tin. 6. Bake for about 10 minutes, or until a toothpick comes out clean (no wet gooey batter). Let cakes sit in tins for 5 minutes and then transfer them to a cooling rack. Store anything you manage to refrain from eating in a waxed paper bag on the counter for up to 3 days.